If you prepare a list of all the inconvenient night-time habits, then snoring would undoubtedly occupy the highest rank. Snoring is not only annoying and inconvenient, but also harmful for the health of the person. Moreover, snoring also affects the peaceful slumber of the person sleeping next to the snorer. Even strong marriages can suffer the fate of separations and divorce due to this gruesome reason. There are many other issues attributed to snoring like sleep apnoea, sleep deprivation, depression, mood swings, etc, and thus it is better to find a cure for snoring as soon as possible. 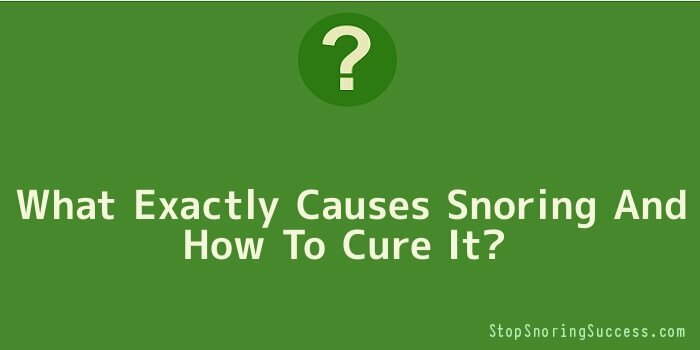 Snoring can be caused due to many possible reasons. There are external factors such as life style changes, drinking, smoking, and other problems. Obesity or being overweight can be one of the main reasons why people snore. With people’s life becoming more and more sedentary in nature, they start gaining more weight. Fatty tissues around the neck and the throat start to grow, which obstruct the normal breathing of the person. This automatically increases the pressure on the soft tissues, creating the noise generally referred to as snoring. In case of drinking, the soft tissues relax and obstruct the airway due to the reaction of alcohol content on the body, and similarly cause snoring issues. Apart from these, there are many internal causes like deformities, allergies, or sinus problems, which affect the normal flow of air, and lead to breathing problems and snoring. There is something common in all the snoring causes. It is the obstruction in the airway, which forces the air breathed during sleep to vibrate the soft tissues in the throat. So, we can conclude that whatever the reason be, main cause of snoring is the obstruction in breathing freely. Thus, experts have found that when the obstruction is removed in some way, the snoring problem will also fade off. There are many anti snoring devices available in the market that promise effective cure for snoring. SnoreDoc is a popular anti snoring mouth guard, which arguably provides the best cure for snoring. The reason for its effectiveness can be attributed to its ingenious design. The mouthpiece innovatively allows breathing by holding the jaws onto their proper place, and making the airway wider, which unblocks the obstruction. When the pressure exerted on the soft tissues is reduced, it eliminates snoring sounds easily.